That’s the message in “Accounting for Sustainability: Practical Insights", which culls insights from a five-year project sponsored by Prince Charles that examined the feasibility of factoring industries’impact on the environment into their economic spreadsheets. Using case studies and interviews with leaders at major accounting firms, the book documents the bond between capitalism and environmental capital. That’s the message in “Accounting for Sustainability: Practical Insights”, which culls insights from a five-year project sponsored by Prince Charles that examined the feasibility of factoring industries’impact on the environment into their economic spreadsheets. Using case studies and interviews with leaders at major accounting firms, the book documents the bond between capitalism and environmental capital. 22 February 2011 | Novo Nordisk, a world leader in diabetes health care, also seized the role as leader in the growing field of sustainability accounting, an “Accounting for Sustainability” case study demonstrates, by embedding the cost of protecting the environment into the company’s business model. The book documents how external stakeholders began pushing Nova Nordisk to become more environmentally friendly in the early ‘90s. In response, the corporation initiated a strategic initiative to embed its sustainability and financial reporting into a single document. This method of reporting turned it into an industry leader by 2004. Its financial reports include, for example, water and energy impacts per business unit for diabetes care and biopharmaceuticals. By allowing business units to track their water and energy usage per business line firms can now report and compare their environmental impacts and performance with other market competitors. Novo Nordisk represents just one of a host of in-depth case studies completed during the five-year Accounting for Sustainability project initiated by Prince Charles in Great Britain. Through Novo Nordisk, the book illustrates by example how sustainability works as a strategic business objective. “Accounting for Sustainability” uses other case studies to illustrate the role of accounting processes to support behavioral and business change; how to select key performance indicators (KPI) and the role of qualitative and quantitative financial and non-financial information. The role of accounting processes to support behavioral and business change, for example, can serve as a significant tool for encouraging and guiding businesses into making more sustainable choices. A case study about the Environmental Agency UK shows how the agency relies on a staff travel hierarchy that embeds sustainability. It factors in carbon emissions to determine whether staff should take public transport, walk, ride a bicycle, or lease a car. Aviva, the global insurance company based in London, meanwhile, uses a “Connected Reporting Framework (CRF)” that allows it to measure key performance indicators focused on five themes. These include customers, environment, people, suppliers, and communities. With this information Aviva can report carbon emissions, waste, and resource usage by its five themes. This results in performance benchmarking based on non-financial reporting. And Sainsbury’s Supermarkets applies qualitative and quantitative financial and non-financial information decision analysis when reporting on their products and the supply chain upstream from their sales. This allowed Sainsbury’s to use reporting structures such as their Lamb Sustainability Assessment report. It looks at Sainsbury’s lamb sales supply chain of over 7,000 ranchers serving more than 500 Sainsbury grocery stores. It then develops key areas of vulnerability, benchmarks these areas, and improves their performance. “Accounting for Sustainability” can be particularly valuable for organizations within the ecosystem services market. Case studies illustrate how to design reporting structures to integrate Key Performance Indicators (KPI) to outperform competitors. Using these indicators a forest carbon project developer could demonstrate superior industry performance by measuring its impact on water and its ability to sequester carbon. Another forest carbon project developer could integrate its dollar cost of production per carbon sequestered. For businesses to thrive, new business models need to factor sustainability into their bottom lines. “Accounting for Sustainability” should inspire the ecosystem services market to develop specific metrics that embed sustainability within business operations. This will allow the transparent comparison of firms and projects and further develop a trusted marketplace. 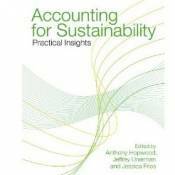 In Memory: “Accounting for Sustainability: Practical Insights” is dedicated to Professor Anthony Hopwood who passed away right after editing its last draft.